The 4K (3840×1920) high image quality provides the immersiveness as if you were there. Real-time video transmission is possible because 4K/30p high-resolution video is generated with low latency. Easy installation and uninstallation at a shooting site makes operation even more flexible. Not only is this system capable of monitoring and changing configuration remotely with a PC via network, but also it allows for control from iPad in a Wi-Fi environment. 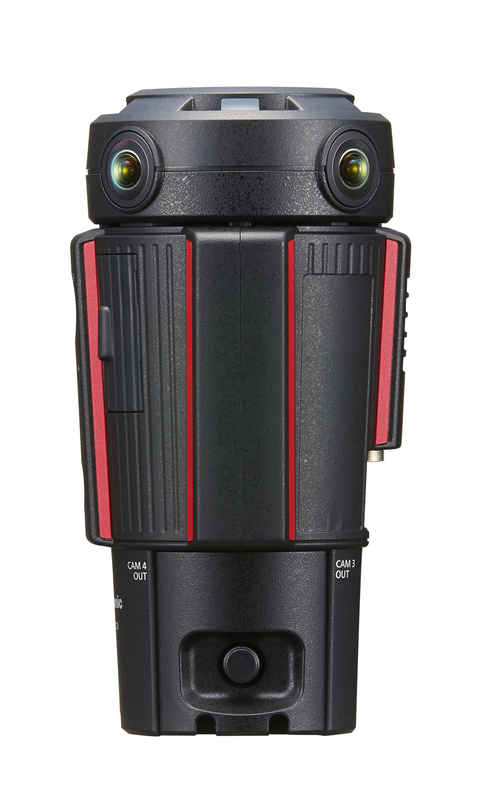 Furthermore, the 360-degree Live Camera is designed for professional use, offering the high reliability with the features that suit their smallest needs such as prevention of unexpected cable removal. High-precision real-time active stitching function enables the camera to continuously change the stitching position by automatically detecting a subject at the seam. It can generate seamless natural-looking video. A seamless video is generated by automatically detecting the object at the seam and continuously changing the stitching position. The master camera automatically controls the exposure and white balance of the images by aligning with the 4-camera system without external connection to a PC, realizing incredible operability that produces natural images every time (factory setting: master camera mode (CAM2)). Natural images are generated by automatically controlling the exposure of the four cameras and white balance to match the shooting environment. This system generates 2:1 equirectangular format 360-degree video by stitching the output of four cameras. It can give your audience the experience of being there live at a variety of scenes, such as live broadcasts of sports, concerts, and other stadium events. The uncompressed 4K (3840 x 2160) output produces high-quality immersive video. 4K (3840 x 2160) output produces high-quality video so fully immersive that you will feel like you are actually there. Capable of monitoring and controlling remotely with a PC or an iPad via the network, this system enables swift 4K production workflow. Easy to install and remove, the 360-degree Live Camera Head is equipped with an HDMI cover that prevents unexpected cable removal, and the 360-degree Live Camera Base Unit has a switch cover that prevents accidental operation. Features like these, developed from years of experience and feedback from clients in live event coverage ensure that your live stream has minimal interruptions. The camera can also be operated in temperatures from 0°C (32°F) to 40°C (104°F) to ensure excellent reliability that meets the demands of professional video producers in live broadcast situations where failure is not an option.